So yeah…..I’ve been slackin’ off on my basics beauty series, ‘So you want to wear makeup….’. But I’m back!!!! So eyes are my favourite part of my face to make up. There are so many possibilities, colour combinations, textures etc. But for those that are beginners, or those who don’t have a lot of time, just a few simple steps could give you a polished look. Before I get into eyes, I have to speak of the eyebrows. Your eyebrows are absolutely important as they frame the eyes and the face. It’s one of the first places that people see. Many people have their brows shaped via threading, waxing or tweezing but really and truly, combing your eyebrows will make them look groomed. This is where a spoolie or eyebrow comb comes in handy. I think the metal brow combs are the way to go! The plastic ones break every 5 mins! Also get a shape that suits the way the hair grows, eye shape etc. Overly plucked brows are a no-no! When it comes to eye makeup, I am a staunch advocate for 2 things: brushes and primers. People always ask me how come my eye shadow stays on all day, even after working out, and the eye shadow primer is the secret. There are lots of primers out there and they don’t have to be expensive. Some of my favourites are M.A.C. Paintpots, Greasepaint Sticks, UD Primer Potion and Too Faced Shadow Insurance. Another popular primer are the N.Y.X. Jumbo pencils. They are cheap and come in tons of colours. They are also available at beauty supply stores and online. Some people even use concealer or foundation. A primer is essentially a base that provides a barrier between your shadows and the oil that your lids produce. Even if you have dry skin, your eyelids produce oil and that oil breaks the shadows down. One thing to note, you only need a dab on each lid, too much could cause creasing. I discuss primers more in depth here and here. The one thing that revolutionized my makeup game was when I discovered brushes. They are what lay colour on smoothly and when you blend with these, you get seamless transitions between colours. Now, I would never, ever dream of using one of those sponge-tipped applicators. They pick up way too much product and dump it on the lid all unevenly. Plus they can be really scratchy on the delicate eyelid. I love shopping for brushes but there are many options and they can be a little overwhelming. One piece of advice that I received was to buy the best brushes you can afford. Doh knock yushelf out trying to buy the latest, limited edition M.A.C. brush. There are good brushes at every price point and you don’t need to have every single one. Target sells the Sonia Kashuk line and I really like her brushes. I have a couple of them and I think they are good quality and they are inexpensive. I also heard a lot of good things about EcoTools brushes available at drugstores. Look for brushes that are soft to the touch and don’t shed too much. Personally, I use M.A.C. brushes, ‘cuz, they are great, handmade and help beautifully with makeup application. 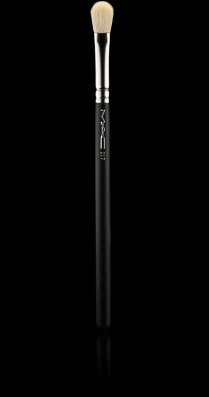 If I had to choose one single brush for all eye shadow application, it would be a dense, dome-shaped brush, like M.A.C.’s 217. I *heart* this brush!!!! It’s made of fine, densely packed hairs that form a dome shape and it’s super soft! This makes it ideal for applying a wash of colour or for packing on colour onto the lid. It’s great for working in the crease, blending out harsh lines, smudging for smokey eyes and foiling. It’s really multi-purpose!! One thing to note here, when you are using creamy or emollient products on the eyes, use synthetic-haired brushes or ones that are mixed natural and synthetic hairs. Creams can destroy delicate, natural fibres. After getting the necessary tools, turn your attention to shadows. Again, these come in a variety textures-pressed powders, loose pigments, creams, shimmers, mattes, frosts and in a countless array of colours!!!!! This is where I have all the fun!!! But for a basic look, stick to neutrals – beiges, greys, champagnes, browns or color that is not too bright, dark or light. Also you could choose shimmery or matte, nothing to glittery. Some of my favourite brands are M.A.C., Make Up For Ever, NARS, OCC, Stila’s Kitten is a customer fave, but again use what you like, and what you can afford. No one says you have to have M.A.C. For a work friendly look, apply a wash or a light application of colour with a soft, fluffy brush (like the 217) all over the eyelid. I have liner on, I could not resist! That’s it. 2 seconds. To finish the basic look, mascara is a must! I cyah live without it!!! Choose a formula – volumizing, lengthening or curling. Soft black or dark brown works for daytime, while deep, rich blacks are great for nighttime. This neutral look is also great for summer when paired with brighter cheeks or lips! That’s it for now! Stay tuned for more on cheeks and lips!